Toysrus.com has posted a sneak preview of Mattel's Green Lantern movie action figure. This "Early Bird" 4-inch figure is being sold for $24.99 and is available for pre-order right now. There have been other images floating around of some of the movie's more extra terrestrial looking figures, but this is the first photo that looks like an official press release. Green Lantern is set to hit theaters June 17, 2011. 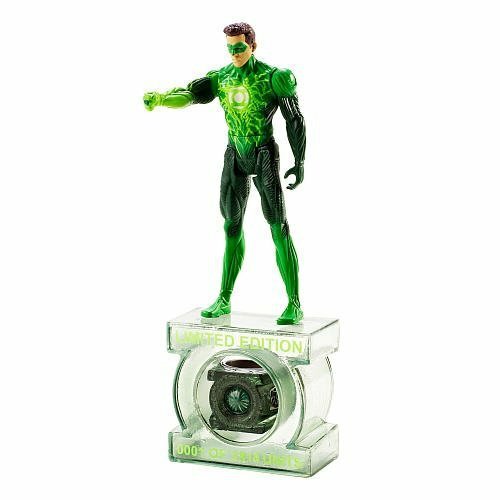 We can expect to see much more Green Lantern product from Mattel at the International Toy Fair starting February 13, 2011. If your green thumb is itching for Lantern figures now, you might want to check out the Christmas clearance section at Wal-Mart. Their exclusive DCUC Green Lantern 5-pack has been spotted for the discounted price of $30.